Season both sides of chuck roast with salt and pepper. Sprinkle both sides with flour. In 12-inch skillet, heat oil over medium-high heat. Add chuck roast; cook about 5 minutes on each side or until brown. In small bowl, beat broth and ranch dressing mix with whisk. Spray 5-quart slow cooker with cooking spray. Place chuck roast in slow cooker; pour ranch mixture over top. Add butter and pepperoncini. Cover; cook on High heat setting 4 hours or Low heat setting 8 hours or until beef is tender. 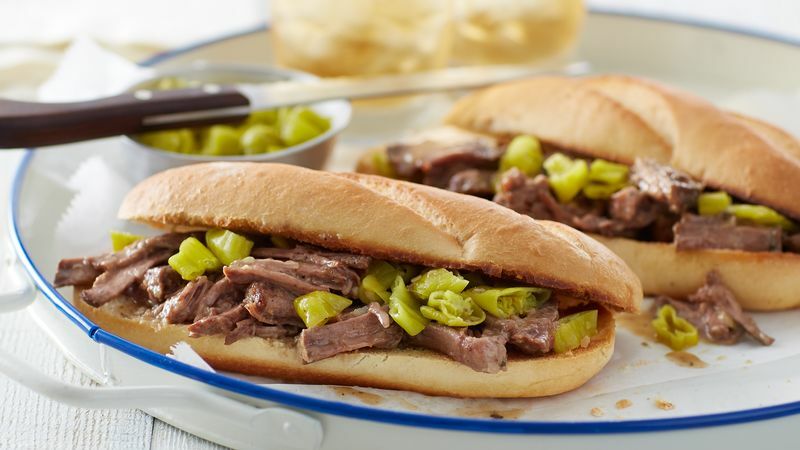 Shred beef with two forks and, using slotted spoon, divide among buns. Serve immediately. The filling is equally good served over mashed potatoes, rice or buttered noodles, as it is inside a bun. Browning the beef before it goes into the slow cooker helps develop the deep, beefy flavor that makes this roast so good.